Secure your family’s financial future with a comprehensive term Insurance plan. Exide Life Insurance Company Limited offers an excellent term insurance or protect plan that not only gives you life insurance cover but also return of premiums upon policy maturity. Pay a nominal annual premium and enjoy comprehensive life cover protection in the case of unfortunate events with Exide Life Smart Term Plan. Classic protection with return of premium: Pay a nominal annual premium for a chosen Life Cover. On completion of policy term, you will receive an amount equal to 100% of the annual premiums. In the event of death, your family will receive the chosen life cover. In the event of death, your family will receive the chosen life cover. 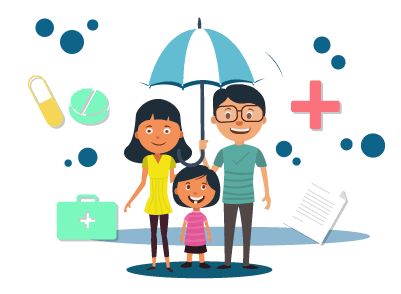 Comprehensive protection with return of premium: First, you have to choose a Life Cover under the Classic variant for a nominal annual premium. In addition to the base cover, you can add a higher Life Cover by an additional annual premium. On completion of policy term, you will receive 100% of annual premiums paid for the Classic variant. In the event of death, your family will receive the total life cover chosen under the classic variant and the additional life cover. You have to choose a variant at the policy inception stage. Keep in mind, the chosen variant cannot be changed during the policy term. Flexible premium paying options: Under the Exide Life Smart Term Plan, you can choose any of the 3 Premium Paying Terms (PPT) - Regular Pay (pay over the entire policy term), Single Pay or 5 Pay (pay for a short duration while being covered for the full policy term). Exide Life Critical Illness Rider: This add-on pays a lump sum amount equal to sum assured if the life assured is diagnosed with a critical illness. This rider covers up to 25 critical illnesses. Exide Life Accidental Death, Disability and Dismemberment Benefit Rider: This add-on gives you life cover protection in the event of an accident, disability or dismemberment. Riders can be attached to a new or existing traditional Exide Life Insurance Plan. Exide Life Insurance offers one comprehensive term insurance or protection plan called the Exide Life Smart Term Plan. It is a non-linked, non-participating life insurance plan that comes with 3 variants to ensure you provide the desired financial protection for your family. You can get enhanced life cover protection by adding an Exide Life Term Insurance Rider for a nominal additional premium. You can also enjoy tax benefits under this plan. Depending on your convenience, you can choose to pay premium once via Single Pay, for 5 years via 5 Pay or for the full policy term via Regular Pay. Under this plan, a woman policyholder gets an advantage of paying a base premium equivalent to the premium paid by a man who is 3 years younger to her. If you choose a higher basic sum assured, you will get the benefit of lower premium rates. The lower premium rates is applicable only for basic sum assured in the range of Rs.10 lakhs to less than Rs.20 lakhs, Rs.20 lakhs to less than Rs.50 lakhs, and Rs.50 lakhs and above. Why one needs Exide Life Term Insurance or Protection Plan? Whether you face the risk of dying sooner or living longer, you will need a life insurance to secure the financial future of your family. Exide Life Term Insurance Plan offers financial protection to your family in the event of your death. The other reasons for having a term insurance are to have a reliable source of income after retirement, benefit from having a second income in the case of critical illness or accident, and to provide for your children’s education, wedding, and lifestyle requirements.